Guess Which Brand Is Now Worth $100 Billion? Millward Brown, a subsidiary of the WPP, has come out with its annual list and report, BrandZ, that ranks the most valuable brands in the world. Unsurprisingly, Google tops the list for the third year in a row, with the Google brand valued at $100 billion, rising 16% in value over the past year from $86 billion. Microsoft comes in second, with its brand valued at $76.2 billion, only rising 8% in value over the past year. Last summer, Google had the no. 2 reputation in the world, according to The Reputation Index, and Microsoft didn’t even break into the top 40 (the company was ranked #43 in terms of reputation). In last year’s BrandZ rankings, Microsoft was third on the list behind General Electric, so the company has inched a little closer to Google. Other notable tech companies that made the top 10 in this years most valuable brands list were IBM (no. 4, valuation: $66.6B), Apple (no. 6, Valuation: $63.1B), China Mobile (no. 7, Valuation: $61.2B), and Vodafone (no. 9, valuation: $53.7B). 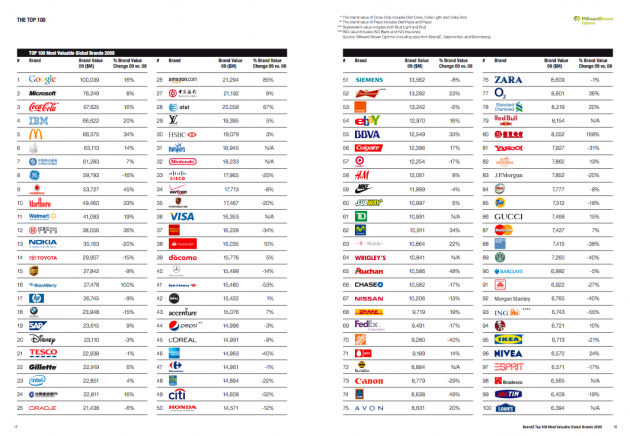 Ten of the top 25 brands are technology brands. Amazon is no. 26, AT&T is no. 28, Cisco is no. 30, eBay is no. 54 and Yahoo is no. 81, falling from no. 62 last year. Yahoo’s brand value went from $11.5B to $7.9B.